Forethought Financial Group is a diversified financial services and planning company established in Houston, Texas in 1985. The company specializes in products and services for seniors, helping to prepare them for end-of-life issues and the related financial concerns. Through Forethought Life Insurance Company, and Indiana-based subsidiary, Forethought Financial Group offers life insurance and supplemental Medicare coverage to its customers. Enter your zip code now to begin searching for online health insurance quotes to meet your needs. The nature of Forethought’s business dictates that their health insurance coverage is not used as an individual’s primary health care coverage. Their policies are meant to be a supplemental insurance product to cover health care expenses not normally taken care of by Medicare Part A and Part B. With all the changes to Medicare policies over the last several years, this type of supplemental insurance is becoming more and more important for seniors. It may be even more so following the full implementation of the government healthcare overhaul in 2014. Forethought Financial Group maintains its executive headquarters in Houston and its insurance operations in Indiana. The company also maintains administrative center in Indiana. We have listed below the addresses and contact information for both the executive and corporate insurance offices. Forethought Financial Group utilizes a long list of independent, local agents for its life insurance products. For its Medicare supplement program, the company utilizes a much smaller list of “exclusive” agents. In utilizing fewer agents for their Medicare supplement Forethought is better able to manage how these policies are written and serviced. The need for such management in this area is demonstrated by the fact that different states have different rules and regulations regarding how Medicare is administered. Local agents will be much more familiar with those state regulations, and therefore much more adept at handling customer needs than a corporate agent. Finding a Forethought agent begins by visiting the corporate website. There you will find contact information for the various divisions within the company. By contacting the individuals listed, you will be able to locate an agent in your local area. For the agents themselves, the website provides a separate section where you can sign up to represent Forethought in your agency. Certified representative may also use this section to logon and gain access to all the available agent tools. Forethought Financial Group receives annual financial stability ratings from A.M. Best, Moody’s, and Standard and Poor’s. All three rating services consistently give them high marks for both current stability and future outlook. The ratings indicate that Forethought Financial Group is well positioned to meet all financial obligations, to both creditors and policyholders. While these ratings are somewhat a matter of opinion, they are highly regarded in the financial industry and are generally accepted as an accurate portrayal of a company’s financial status. Furthermore, Forethought Financial Group was ranked among the Top 50 Best Life Insurance Companies in America by Wards in 2010. This prestigious ranking puts Forethought among elite company when you stop to consider how many life insurance companies exist around the world. Being ranked so highly is a testimony of not only Forethought’s financial stability, but also their commitment to keeping customers happy. Forethought Financial Group presents its career opportunities as a means for employees to reach beyond their own expectations and pursue being the best they can be. Although the company is focused on business, their philosophy regarding employees is that each one should be able to fully develop professionally rather than simply just work for the company. 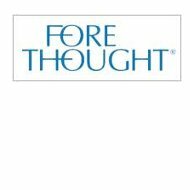 Forethought provides competitive compensation as well as a list of benefits, which include medical insurance, life and accident insurance, disability coverage, flexible spending accounts, retirement plan, paid holidays and vacations, and educational assistance. The corporate website contains a careers link where interested candidates can get started in their search. The careers section provides a brief description of what the company offers along with a list of current job openings. Clicking on an individual job listings provides a downloadable package in PDF format providing complete job description, requirements, and instructions for applying. Interested candidates will be able to prepare resumes accordingly and send them to the appropriate HR office. Your online search for health insurance rates begins by entering your zip code into our free search tool below.